You know, I have always had a thing for the type of people who are unquestionably themselves. The ones with crazy ideas and even crazier souls. That sort of people who put their hearts on their chest and have passion in their tears. And once in a life time, one of these people will enter your life as a temporary happiness. But the reality is that when two rare souls or two extraordinary minds met themselves and cross your path, that happiness is no longer temporary, it stays forever. And that’s exactly what happened one year ago. Two extraordinary hearts and messy souls crossed into Tucco’s path and we could never thank them enough for letting us be part of that day, the day when the extraordinary became real. 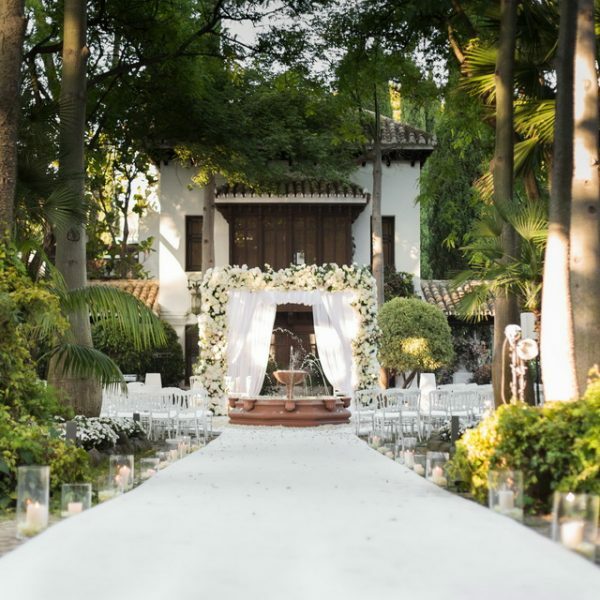 If something was clear from the very beginning is that E&A wanted their day to be memorable and we could not have achieved this without the collaboration from the teams of Pedro Navarro, Goyo Catering and Soul Events. From the beginning to the end, every single detail was meticulously designed. Refined and sophisticated were clearly the lines to follow and that’s why we decided to use see-through elements and furniture for the tables, chairs and signs which added a lively yet chic touch to the table set up, while complementing and enhancing the silver and glass elements. Lighting was used at its best. Mauve lighting dyeing the vegetation and indirect lighting for the tables were just some of the elements we used to enhance the beautiful scene. The menu was designed as an extraordinary gastronomic experience for all senses, from the touch and the smell to the sight and the taste. Spanish and Japanese hints were introduced throughout the courses and a heavenly desserts table for the big finale. And it couldn’t have been other way. When the extraordinary knocks on your door, either you take it and make a temporary happiness out of it or you embrace it and make it last forever.